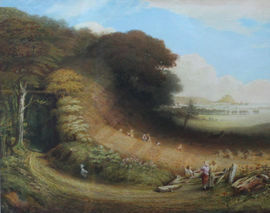 John Linnell (1792-1882) was an English landscape and portrait painter and engraver. Linnell was a naturalist and a rival to John Constable. He had a taste for Northern European art of the Renaissance, particularly Albrecht Dürer. He also associated with William Blake, to whom he introduced Samuel Palmer and others of the Ancients.